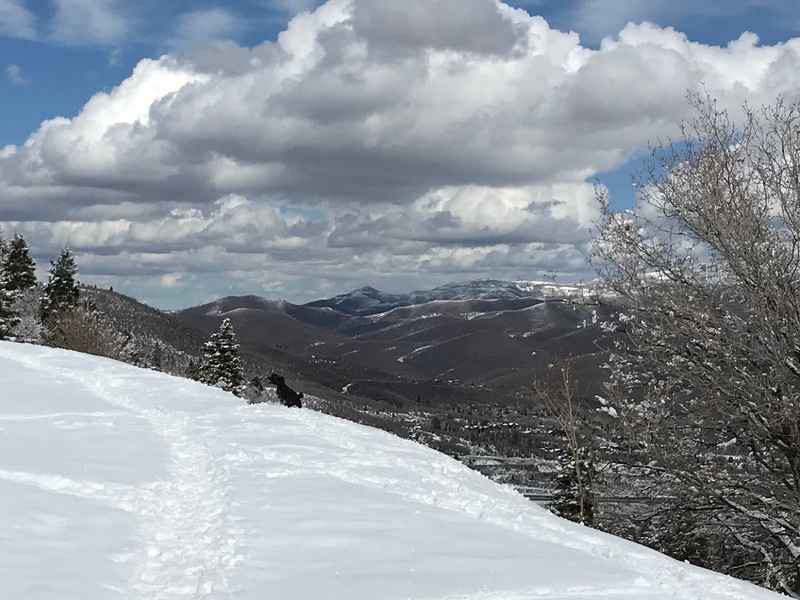 Friday was a pretty day, so the pups and I did a hike on the firebreak road. I tried to get a photo of them running and finally settled for a video. I couldn't figure out how to post it here, because it isn't on YouTube. I'll add it if I can figure it out. Common Threads met at Karan's on Thursday. It snowed, and Georgette picked me up, so DH could stay in bed. He was clearing the drive when she brought me back. There were just the three of us. 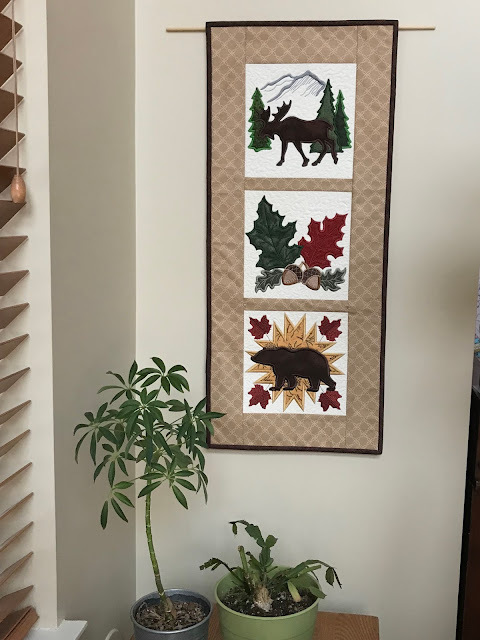 Karan had finished this little wall quilt and had it on the wall already. I worked on my reboot of the Coastal Skies. This is the third pattern I've used, and I think, as the saying goes, "third time's the charm." It's a fairly easy pattern. The first st is always slipped. The RS has YOs at the beginning and end of the two halves. The WS is just K all the stitches after the first slipped stitch. Almost mindless, so a good project for chit-chat. I decided to put a brightly colored marker at the beginning of the RS row, so I would remember which row I was on. It snowed again Saturday. I finished Mandy's snow pants just in time for the snow. The pants are a free cut-and-paste pattern from cataddict's project page. 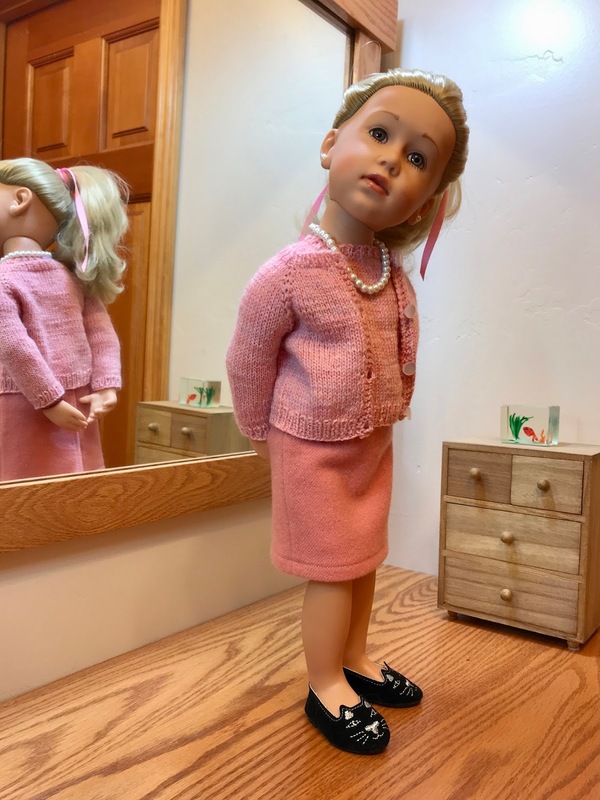 It's designed for American Girl dolls, but it worked OK for Mandy. They're a little baggy, but warmer that way, right? I skipped the short rows across the derrière as Mandy doesn't have much there. It goes well with Mandy's Stavanger Cardigan. 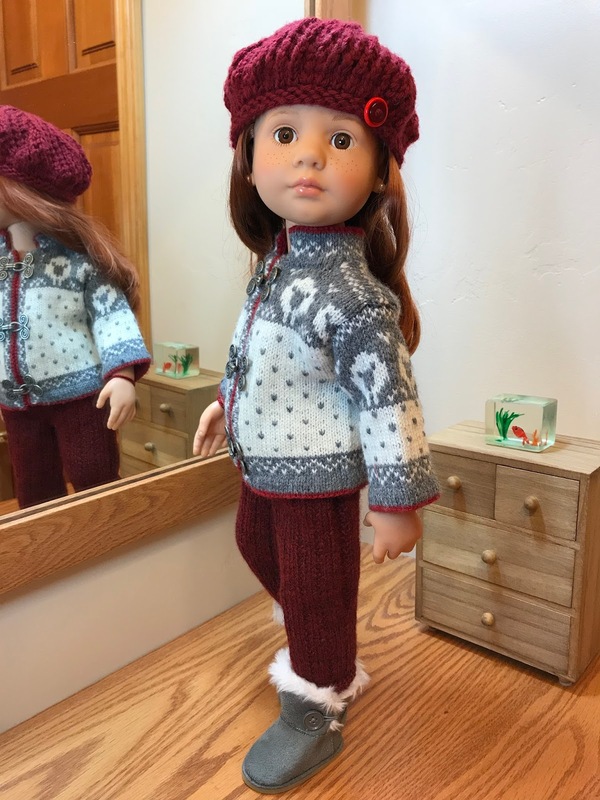 At least two people are planning on making this project, including a lady in New Zealand who wants to use the pattern to teach steeking to a friend. A straight/A-line skirt has been designed by Lilli & Fleur Couture, and I did a practice test of the pattern. My friend Andrea, who is the designer for the company, hopes to have the patterns ready soon. This one is slated to be a freebie. She will publish the skirt pattern with a link to my twinset pattern. I'll publish the twinset pattern with a link to the skirt pattern. The packing is moving along slowly. 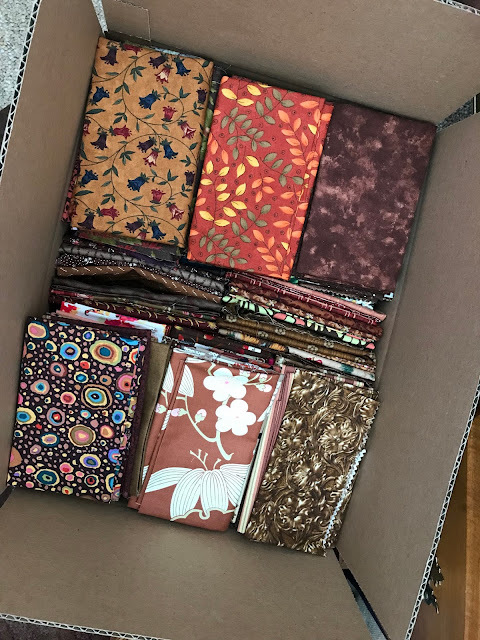 Here's a small box almost filled with yardage and fat quarters. I added more before DH taped it shut. It's a book box, the size chosen because it was going to hold only fabric. I have another pile of stuff to take to Savers. They even take old single socks and worn-out clothes. Things like that that they can't sell get ground up to make insulation. Here's Miss Daphne's birthday doll, ready to ship to Wisconsin, although her birthday isn't until the middle of May. I'm trying to move out of the house as much stuff I don't need to get into before the move, so she's on her way, due to be delivered today. 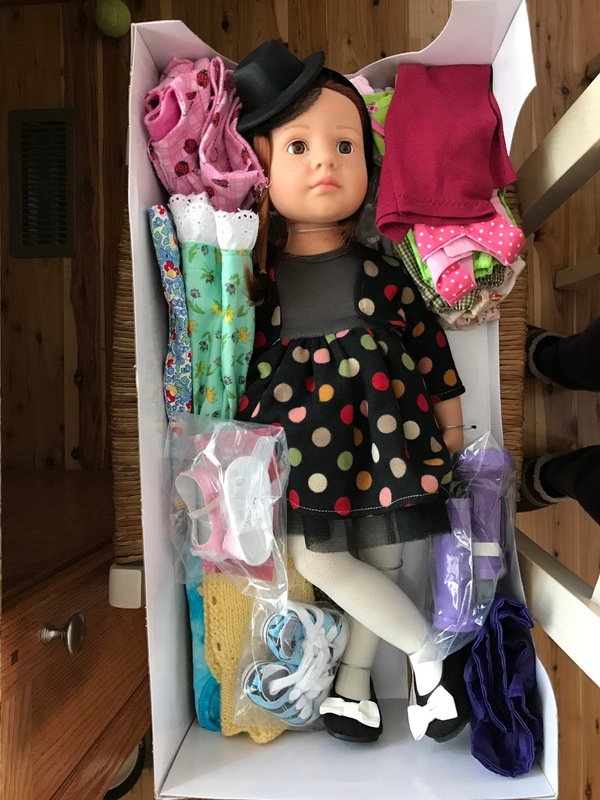 Included in the box: undies, PJs, rain coat and boots, sneakers, sweater, two T-shirts, leggings, slacks, sandals, shorts and capris with tops, and two dresses. The birthday is in May, but I want to be sure the doll is there in time. Katie 2015 will be sooooo glad to get out of her restraints, but at least she can admire her wardrobe while she travels. (I wonder if I should have put her glasses on her; the wardrobe is so close.) I've had her for about 10 months. She's a Götz Happy Kidz Katie from 2015, like my Mandy. 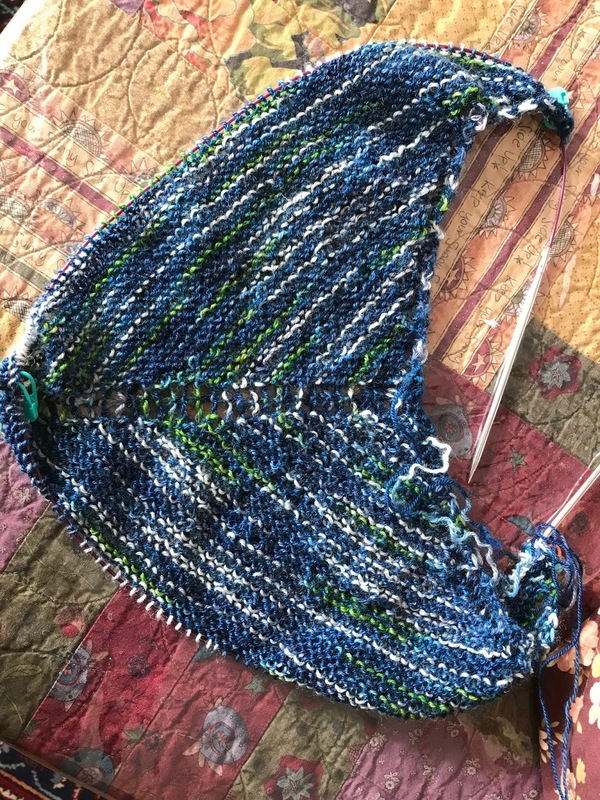 What's on my needles: Finally the Coastal Skies Shawl, using the Knockout Round pattern. What's on my Featherweight: Easter dresses. What's in my hoop: Spring Flowers appliqué quilt. Making progress. What's on my wheel: Stanzi is packed away. What's on my iPad/iPhone: Finished Listening to Miss Tonks Turns to Crime by M. C. Beaton. Now listening to Russian Roulette by David Corn and Michael Isikoff. On my Kindle app is Miss Braithwait’s Secret by G. G. Vandagriff. What's in my wine glass: Ha! Guinness for a change, and it's in a beer glass instead of a wine glass. What's my tip of the week: I've mentioned dealing with onion peel before, but here's an addition. As I said, cut the onion in half from stem to stern, then trim the stem end and the stern end (actually, the end where new growth comes out). If the onion skin won't just pop off on its own, remove one thick layer, turn it inside out, and the skin should pop off. Slap the layer back on and start chopping. Katie will be glad to get out of her restraints. Beautiful view! Daphne is a very lucky girl! She will give Katie lots of love. It's snowing again. I won't miss having so much snow. That is a stunning view. I would miss it too. Good luck with your renovations! That’s always challenging. Katie will be very loved! We were thinking of moving this past Fall, just to have more land. Luckily, we realized that with a few modifications, we would love staying in the home we've been in 40 years. So, while we have been in Fl. the contractors have been at it. Will be fun to go home to. Packing is never fun, but a great time to unload!!! Katie made it safely to Wisconsin. Good thing; the last one sold I heard about sold (today) for $50 more than I insured her for. I'm going to miss our view. Peggy, that scenery showing the mountains is breath taking. Where are you moving to? I love Karan's wall hanging. So Katie is taking a trip to Wisconsin to live with Daphne. I'm sure they will have a lot of fun. One thing for sure Katie has plenty of clothes to wear once she gets there.